Voorhees College is an accredited four-year liberal arts college in Denmark. The historically black college began with one woman’s vision for black schools in the rural, segregated South. Elizabeth Evelyn Wright, a graduate of Booker T. Washington’s Tuskegee Institute in Alabama, was so inspired by Washington and her own education that she made it her mission to open black schools where there were voids. 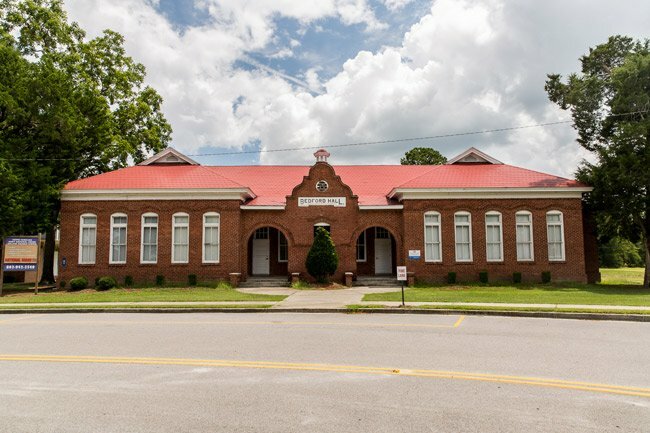 Wright arrived to Bamberg County in the late nineteenth century and started the Denmark Institutional School in 1897. In 1902 New Jersey philanthropist Ralph Voorhees donated funding towards the school’s first building, and the school officially opened with Wright serving as principal. It was the only black high school in the area. The school needed further funding, however, and in 1924 the Episcopal-affiliated American Church Institutes for Negroes stepped in and offered support. By 1947 the school became the Voorhees School Junior College, and it received its four-year accreditation in 1962. 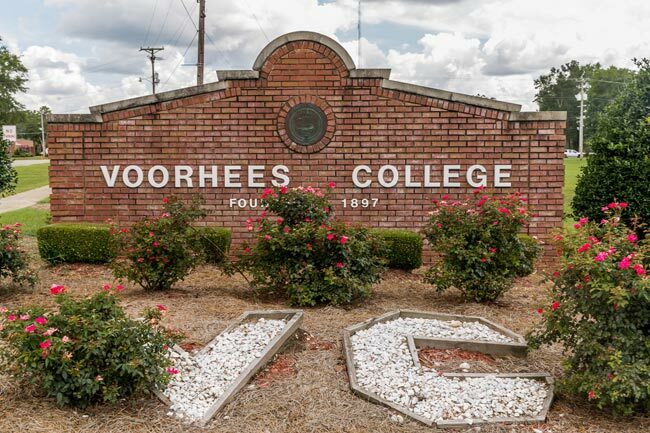 At that time the school’s name was changed to Voorhees College. 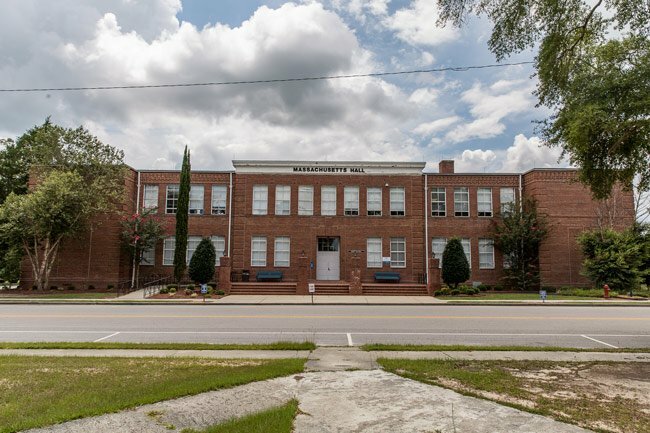 From 2008 through 2016 the school was led by Dr. Cleveland Sellers, an activist during the civil rights movement who was injured by gunfire during the Orangeburg Massacre. The incident galvanized Sellers to become an educator. Dr. Sellers also served as warden of the college’s St. Philip’s Chapel. 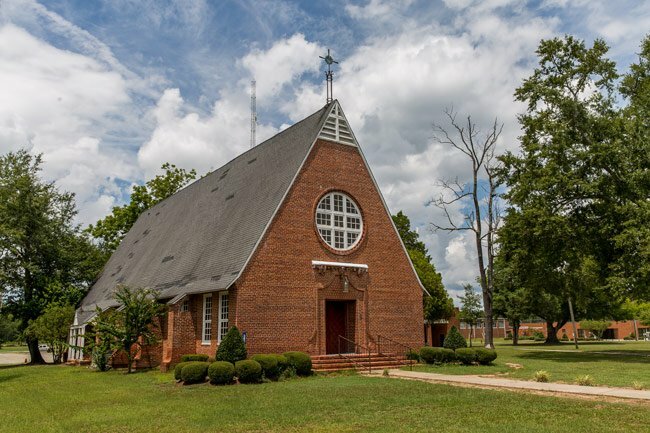 Voorhees College maintains a strong relationship with the Episcopal church, and students can attend services on campus, which also welcomes residents of the community. 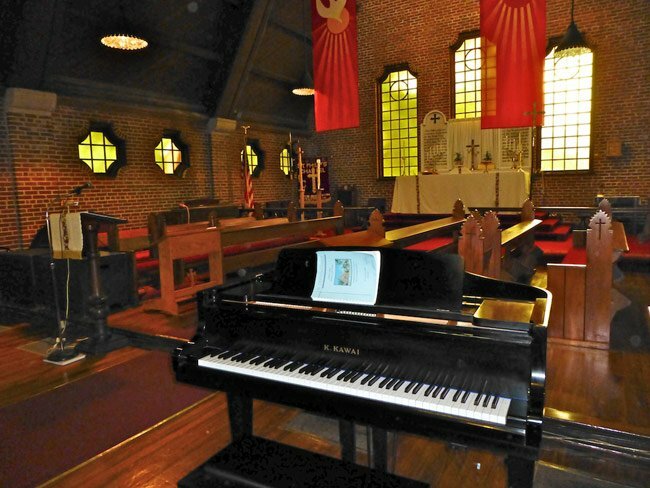 While the Voorhees campus boasts state-of-the-art science and technology facilities, the college is also home to many historical buildings, including the aforementioned St. Philip’s Chapel, seen below. 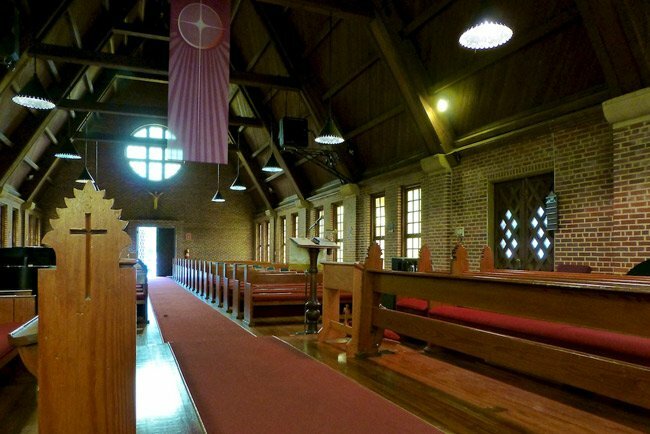 The chapel was built in 1931 by masonry students of the college. 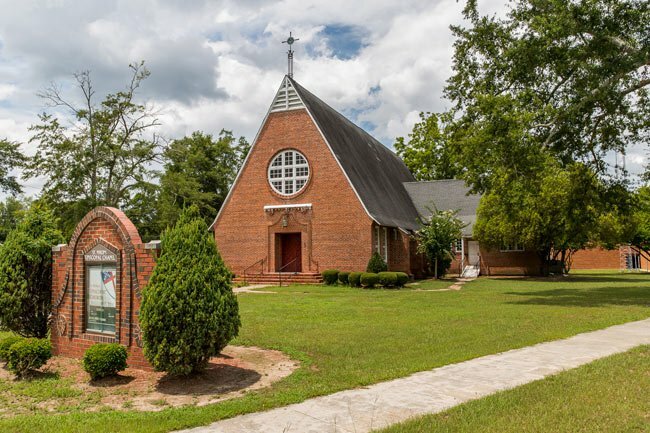 Details of the chapel include a steep-pitched gable roof, a decorative exterior, and interior brick work. The chapel was dedicated in 1935. 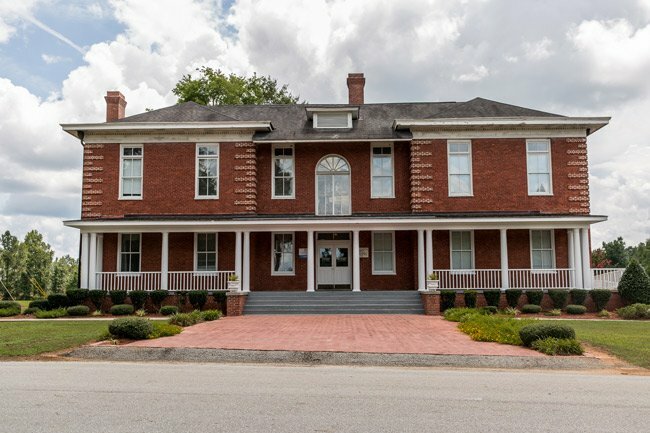 The Booker T. Washington Building, pictured below, was built as a hospital in 1905. 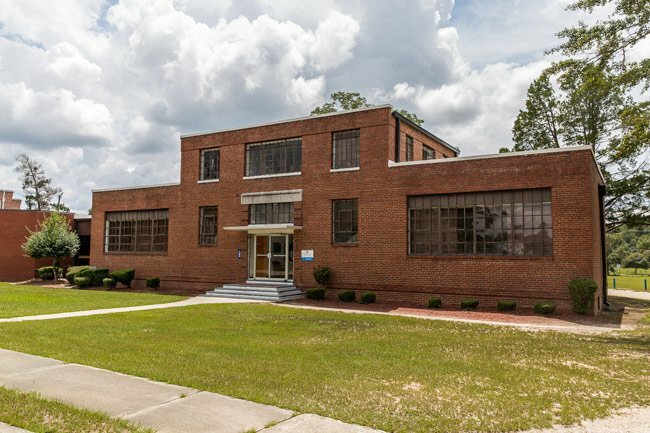 It was designed by a professor from Claflin College, a neighboring black college in Orangeburg, and was built solely by African Americans. Today it serves as an administration building for Voorhees, housing the office of the president. The Menafee Trades Building below was added to the campus in 1907 as a gift from Ralph Voorhees. It housed the trade school and was named for Martin Menafee, who once served as treasurer of Voorhees. Menafee was the husband of school founder Elizabeth Wright. Today the building is used for upperclassman housing. The charming structure seen below was built in 1912 and named for the Reverend R.C. Bedford, a friend and aid to Booker T. Washington. The Reverend Bedford also served on the school’s first board of trustees. Originally used as a dining hall, today Bedford Hall is a faculty research building and contains classrooms. Wright Hall, seen below, was named for Voorhees College founder Elizabeth Wright. 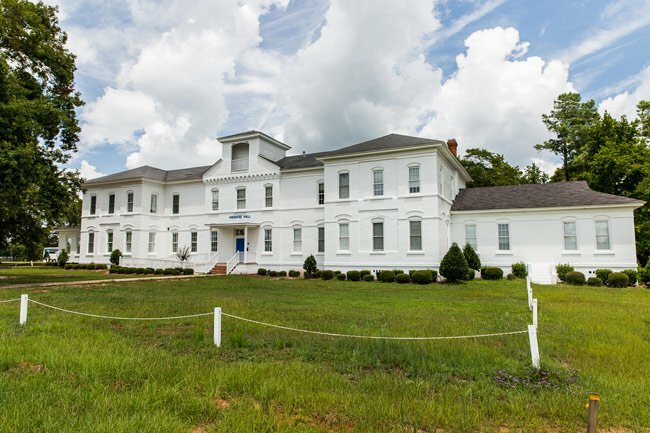 The three-story brick building served as a dormitory when it was built in 1932. 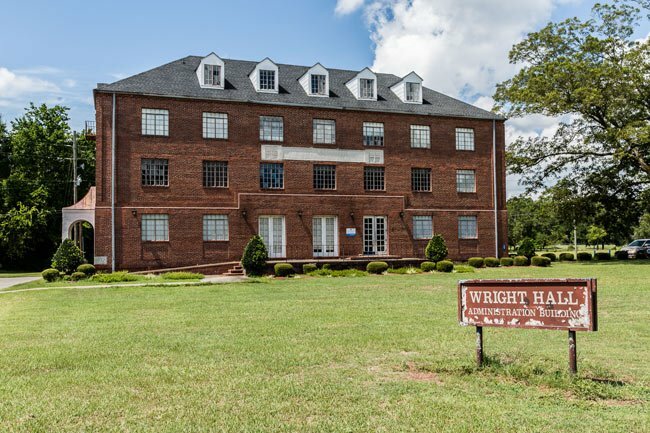 Today Wright Hall acts as the Business Office and the Office of Financial Aid. Notable features include casement windows and a corbelled brick cornice. Pictured below is the campus’s first academic building, Massachusetts Hall. Added in 1930, the two-story brick building was named for the Diocese of Massachusetts, which has helped support the school financially over the years. Massachusetts Hall includes an auditorium and now houses the Office of the Registrar as well as Academic Affairs. The St. James Building below was completed in 1932. It housed both overnight guests as well as the economics department. It later became home to the Department of Business and Economics, and today St. James continues to be the location of the Division of Business as well as the Divisions of Professional Studies, Finance, Criminal Justice, and Sociology. 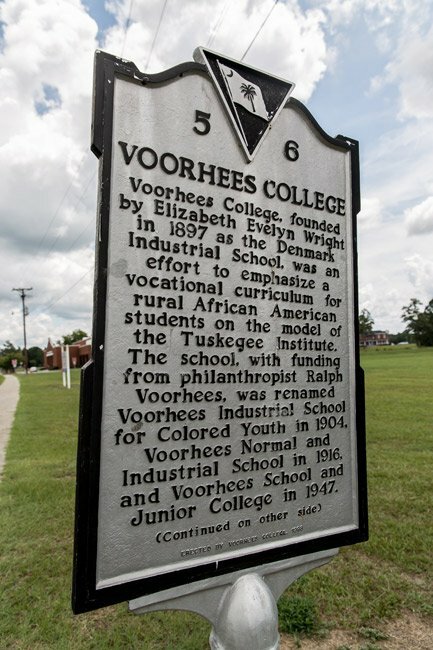 Voorhees College was founded in 1897 as Denmark Industrial School by Miss Elizabeth Evelyn Wright. 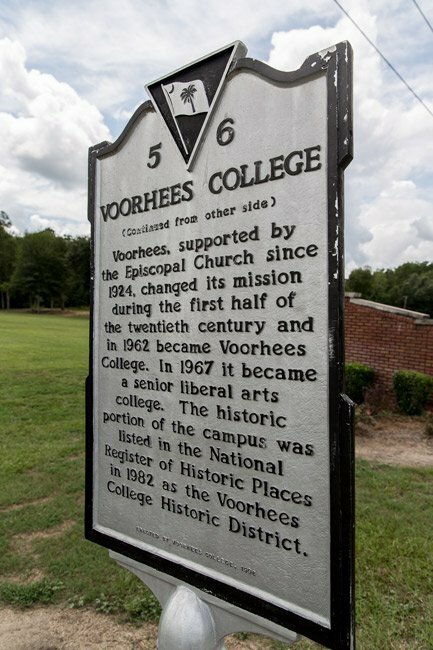 The Voorhees College Historic District is comprised of thirteen contributing buildings built between 1905 and 1935. The district’s significance is derived from its importance as a pioneer in higher education for African Americans in the area and from its association with Elizabeth Wright, teacher, humanitarian and founder of Voorhees. Elizabeth Wright’s determination to establish a school for poor African Americans based on the ideals of her mentor, Booker T. Washington, for whom the 1905 hospital was named, never wavered in the face of anger, distrust and prejudice. Her high ideals inspired those who worked with her as well as her benefactors. In 1923 Voorhees became affiliated with the Protestant Episcopal Church and the American Church Institute for Negroes. Many of the buildings on campus were built by students at the campus. These brick buildings had leaded glass windows, curvilinear gables, dentil moldings, decorative brickwork, and cupolas. The buildings were not simply utilitarian but reflected an admiration for architectural design and a desire to master masonry techniques. Please send us any photo you wish for us to consider adding to the South Carolina Picture Project. The project exists only because of generous contributors who also care about preserving SC history! Will you consider adding a picture Elizabeth Evelyn Wright the founder of Voorhees College to this page?